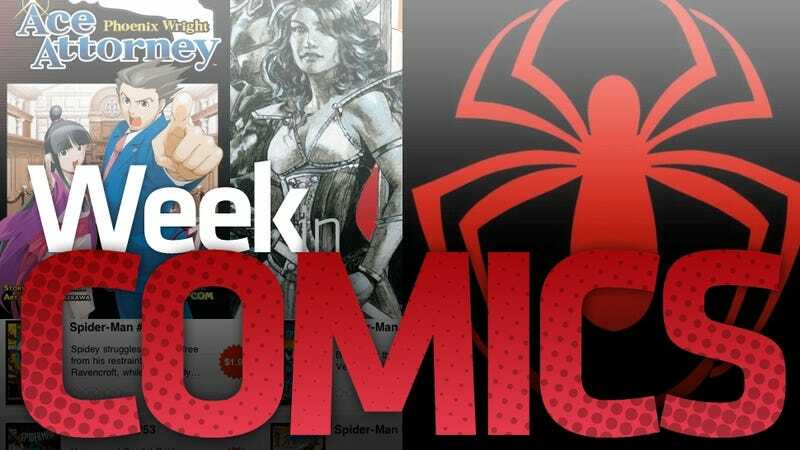 There are new comics in the comics shops every Wednesday, but some of those comics are not worth your money. As always, I have recommendations about which comics—physical ones and digital ones—you should consider buying. You're welcome! Plus, I've got a list of all the new video-game-related comics out this week. Brightest Day Aftermath: The Search for Swamp Thing #1 This is the first full Swamp Thing and John Constantine story set in the DC super-hero universe in about a quarter century, the first since Alan Moore's brilliant run on the old Swamp Thing comic. Swamp Thing's best stories were somehow simultaneously soulful character dramas and philosophical examinations of plant-life. Constantine is, at his best, a great, cynical investigator of the macabre. This duo is going to be an odd fit in today's DC Universe. This new mini-series guest-stars Superman and Batman. Consider me intrigued enough to buy this. Dark Horse Presents Vol. 2 Another issue, another batch of entries from all-star creators Howard Chaykin, Neal Adams, Paul Chadwick and more. But, you must notice that this anthology's cover features a man fighting his own blood. That alone is worth at least half of the $8 cover price, as far as I'm concerned. Flashpoint: Kid Flash Lost I'm loathe to recommend a Flashpoint tie-in considering how uneven the quality of these crossover books has been, but this one is written by Sterling Gates, an under-used writer who had a surprisingly magnificent on Supergirl for a few years. His plotting and scripts tend to be original and fresh. Ultimate Comics Spider-Man #160 I believe they're killing Spider-Man in this issue, but I've managed to not get spoiled yet. DuckTales #2 Written by game designer Warren Spector! Official summary: "Scrooge McDuck's collection of exotic artifacts from around the world are suddenly deported from the McDuck Museum back to their original locations! Wild repossession recall ensues as Scrooge, Launchpad, and the gang jet to the sites of McDuck's most infamous adventures, in a bid to reclaim his whisked-away wealth and take on some restless natives along the way! From the man who brought you Epic Mickey comes an original epic DuckTales series!" The Guild: Bladezz Official summary: "The Guild creator and star Felicia Day is joined by series director Sean Becker for a new one-shot starring the Knights of Good's brash young rogue, Bladezz! In this issue, it's the secret origin of Bladezz's alter ego, the supernaturally gifted model Finn Smulders! When all he wants is a place to play the Game, and faced with a controlling mother, know-it-all sister, and obnoxious potential stepfather, can Bladezz use Smulders's 'powers' to save the day? Can he keep his new identity secret? And can any good possibly come of fatherly advice from Vork?" Kane & Lynch (trade paperback collection) Official summary: 'Following the bullet-ridden finale to the bestselling video game, Kane and Lynch decide it's best for everyone if they go their separate ways. That is, until a contract is put out on their collective lives for a huge bounty - and every assassin and two-bit goon around the world is gunning for the volatile pair." King of RPGs Vol 2 (manga) Official summary: "Shesh Maccabee has a problem: Whenever anyone says the words 'my character,' his dark personality activates. Everyone's careful not to push his buttons - except Roma, the cop bent on getting Shesh behind bars. When Romas tracks him down in the game World of Warfare, catastrophe strikes, and Shesh's dark side is unleashed! Only Shesh's friends can take him down, and there's only one place to do it - the biggest World of Warfare convention in the world!" Phoenix Wright: Ace Attorney Vol. 1 (manga) Official summary: "Ace attorney, Phoenix Wright is at it again, protecting the innocent and helping his friends with his amazing skill as a lawyer. Fans of the Ace Attorney video games will love this manga, which follows Phoenix Wright and his courtroom triumphs." Rage #1 Official summary: "The groundbreaking new game from the developers of Doom and Quake is almost here, but first Dark Horse presents an essential introduction to the world of Rage! The Earth has been devastated by collision with an asteroid, with a tiny fraction of the population surviving in life-sustaining arks, only to awaken in a wasteland controlled by a global military dictatorship called the Authority. But a rescued scientist learns that the Authority has lied to her and the other survivors about how this new world came to be." Isle of 100,000 Graves This is a new Jason comic, which is more than enough for fans of the great one-named Norwegian comic book creator to know in order to buy this slender $15 graphic novel. But if you don't know Jason, or if you heard, correctly, that he's teamed up with a writer for this one and are worried about that, let me help you out a bit: Jason's comics are simply drawn and expertly crafted. They're often somber stories about the loves and failings of ordinary people. But the ordinary people in these comics tend to… have the heads of animals, fight werewolves, time travel to try to kill Hitler or sometimes turn into zombies. In this one, we've got a young girl whose father supposedly was lost or captured while hunting for treasure on a remote tropical island. She tricks a pirate into helping her reach the island to find her dad. Unfortunately, the island is actually the campus for what I can best describe a grammar school for young, aspiring executioners. Do you think it's going to help her or hurt her this girl that she crosses paths with one of the young, hooded students who is as bad at learning to strangle people or use a guillotine as most grade-school kids are at picking up advanced calculus. We've got typically lovely Jason art mixed with this bizarre story that's really about the destinies kids can forge for themselves in a world populated by relatively insane adults. Highly recommended.